J and B and Lady Blue: Not One but Two Surprises!! Not One but Two Surprises!! So-----we were minding our business at Cape Cod, North of Highland Campground. Sean and Scott had prepared a great seafood dinner. And then Scott made an announcement. 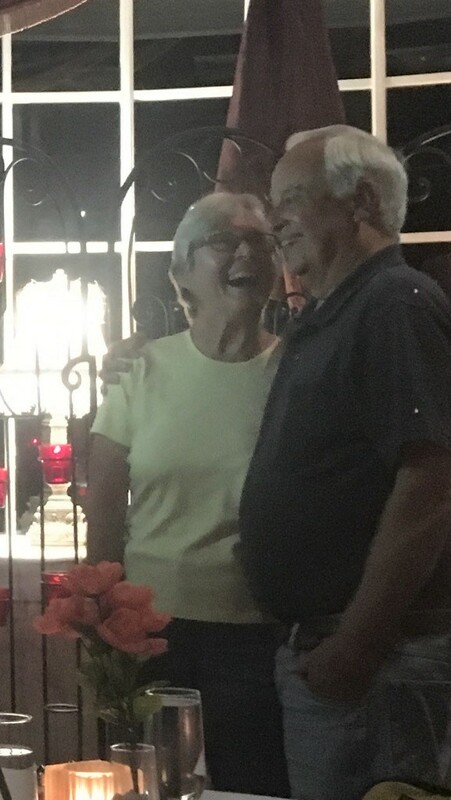 He mentioned that since it was our anniversary, 50th to be exact, all of our children had gotten together to give us a special present. Scott had found a car renter on Cape Cod who just happened to have a special car that they had rented for us to enjoy the next day--our anniversary. They even printed a possible itinerary. That included cruising some back roads of Cape Cod and having lunch at the Bookstore Restaurant in Wellfleet. What a special four children! 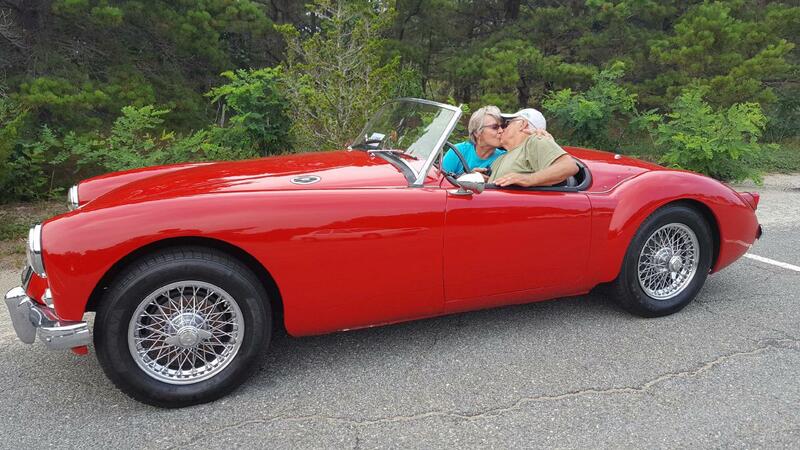 Oh--did we mention that Scott had found a gentleman who rented antique cars? How about a 1958 MGA, 4 speed . A little orientation at the Wellfleet Harbor dock and away we go. The first stop is PB Boulangerie in Wellfleet. The owners are chefs from France and it is an experience just to walk in to this bakery/restaurant. 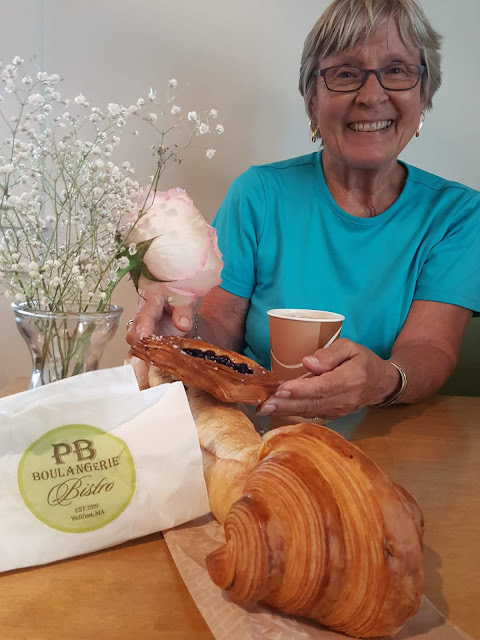 Note we found some French coffee, croissant, a baguette, and a blueberry patisserie. 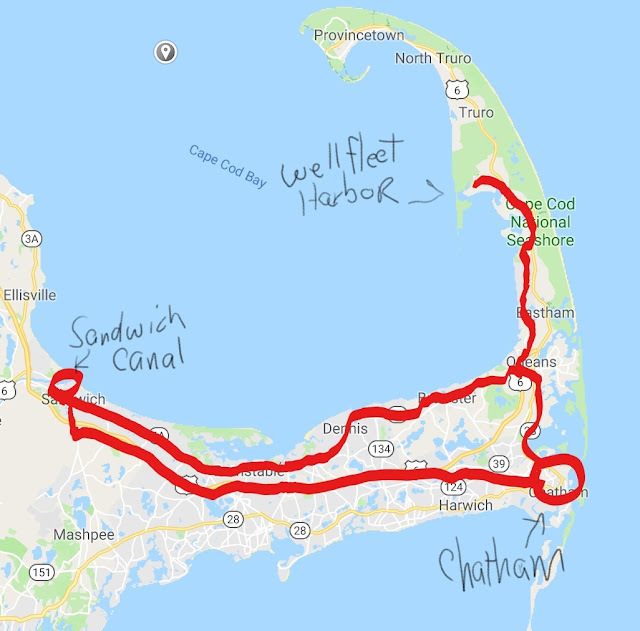 Our route took us from Wellfleet Harbor to Route 6 , then off on a back road to the Orleans rotary. 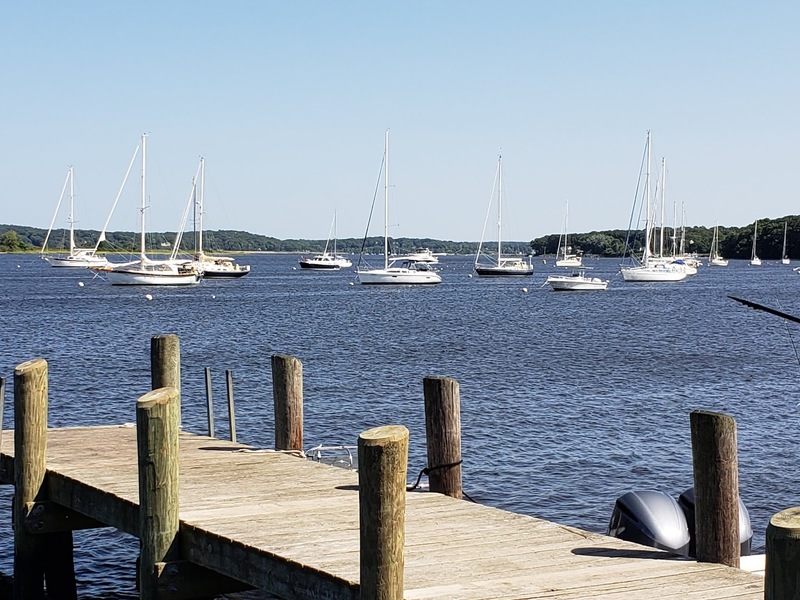 A very picturesque route--thankful for a sunny day for this ride--following Route 6A to the Sandwich Marina and canal. 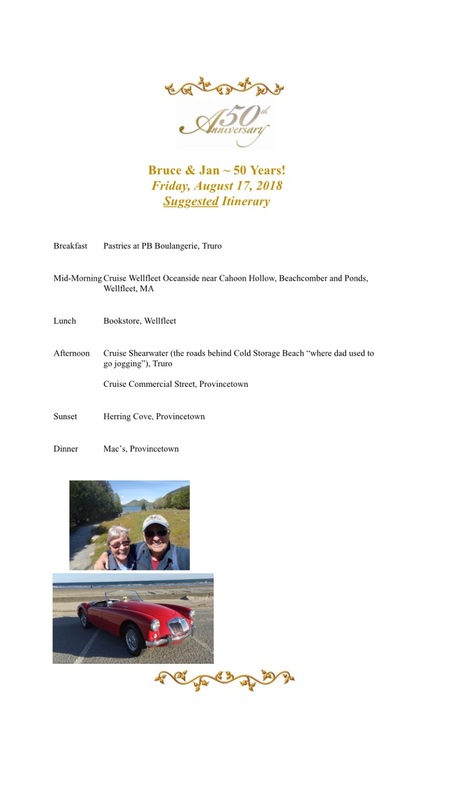 Then back on Route 6 this time--only so many daylight hours--and off to Chatham for a stop , and then back to the Marconi Beach parking lot to exchange once more for Lady Blue. 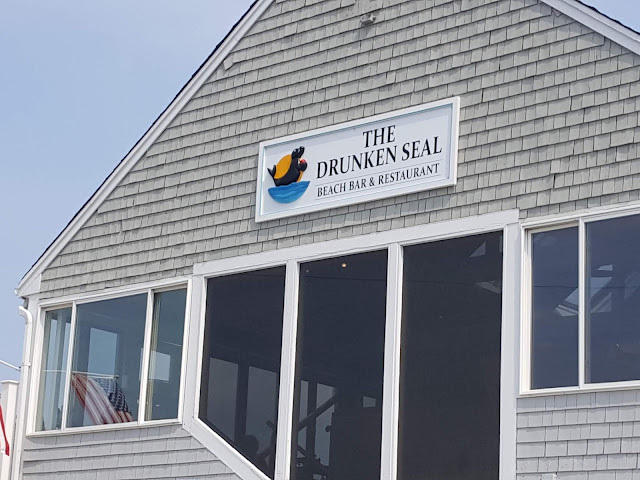 At the Sandwich side of the Cape Cod Canal, we make a stop at The Drunken Seal. What fun it was to have people stop and say "Great Car". To which we would answer "Thank you very much! We love it"
Time for a selfie on the porch. Cape Cod Bay in the background. 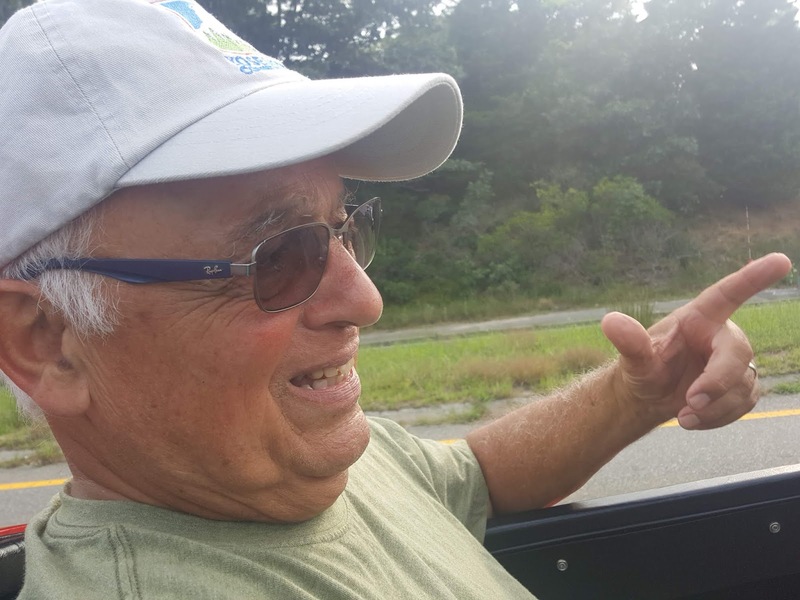 Driving back on Route 6, is Bruce having too much fun? Two hands, Bruce. Remember the clutch and 4 speeds. Off Route 6 and another pretty road to Chatham. and we stop at the Impudent Oyster. 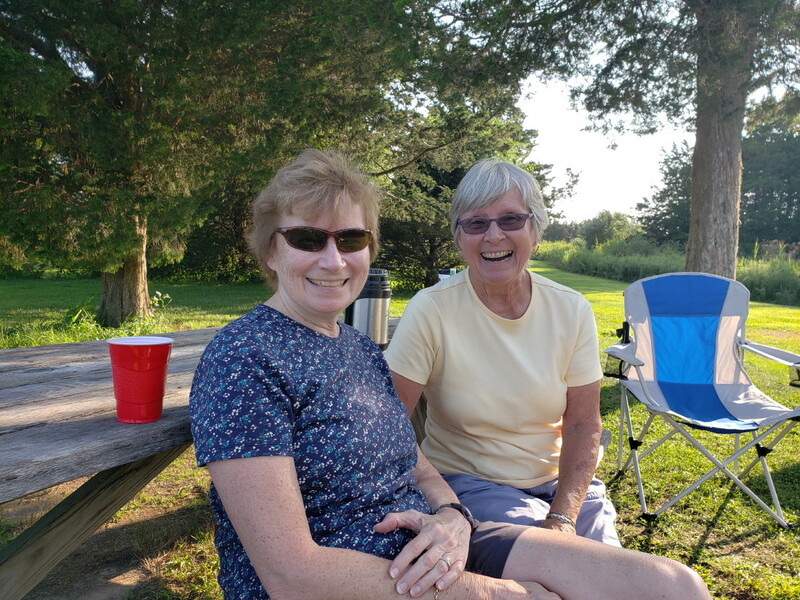 Jan worked a summer in Chatham, the year before we were married. A wonderful spot for our celebratory glass of wine. Then we head towards Orleans on Route 28 , and eventually Marconi Beach to trade for Lady Blue . 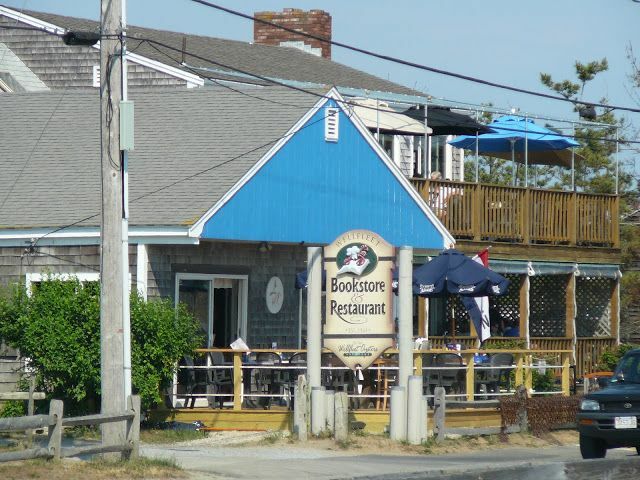 dinner at the Bookstore Restaurant in Wellfleet. 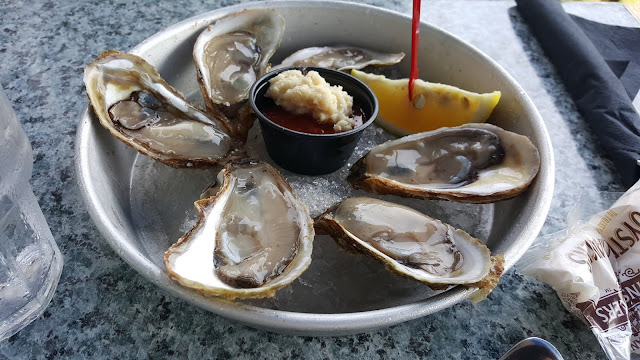 Of course it included oysters. 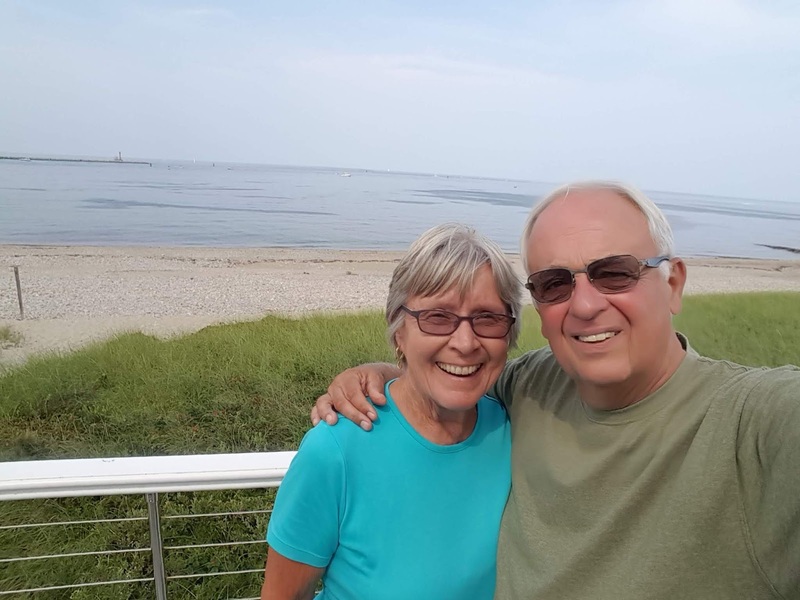 That was about the end of our stay on Cape Cod. 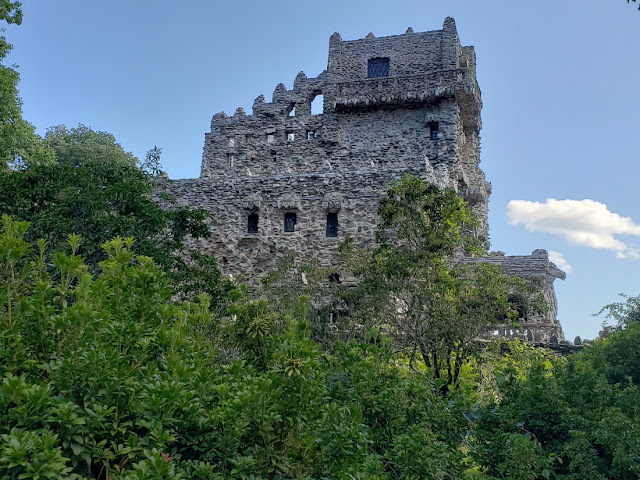 We headed west to Hammonassett State Park in Madison, Connecticut. We meet up with Jan's sister Marsha. 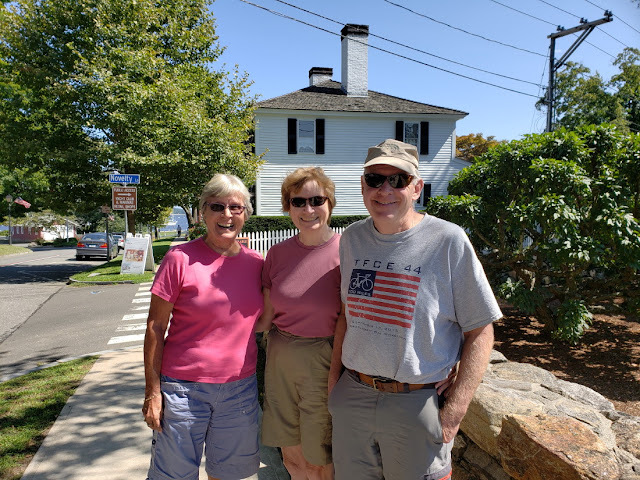 She and husband , Mark, take us for a pleasant leisurely tour of Essex, Connecticut--a beautiful historic coastal town. The homes are well landscaped. A good selection of sailboats in the harbor. 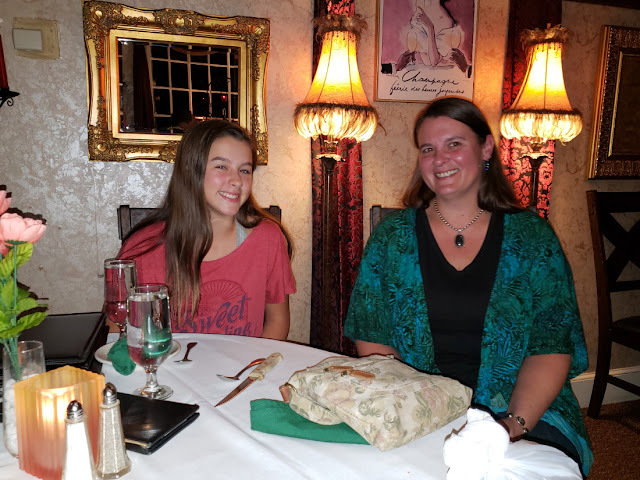 A great meal and lots of fun checking all the historic pictures and mementos of sailing ships and more. 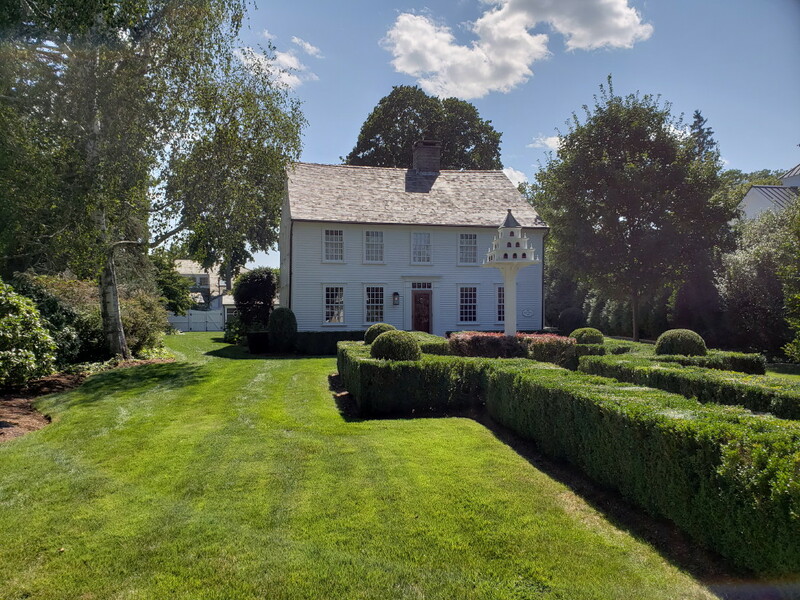 The inn dates from 1776. Mark and Marsha had taken us out to dinner and also Marsha had a few special gifts. Some beautiful yellow roses, a purple violet, and a special commemorative 50th wine stopper. 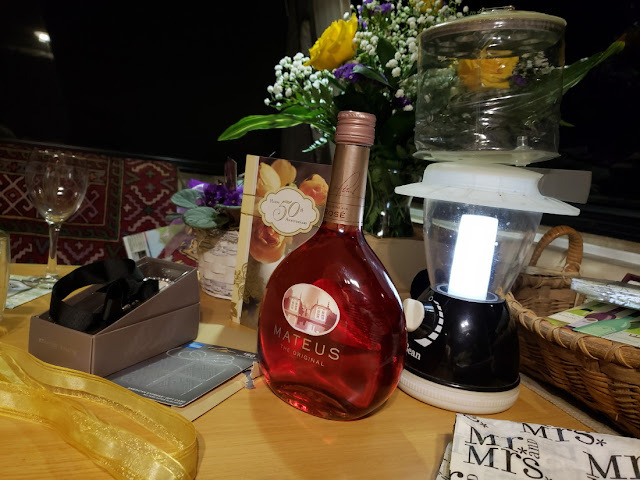 We had forgotten , but Marsha found out that Mateus sparkling rose wine was a common wine we were friends with at that time. 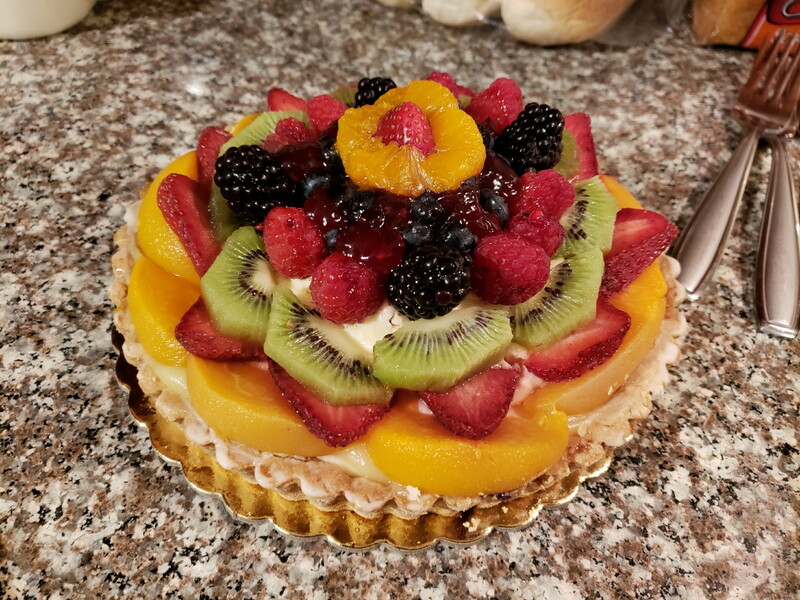 Gary and Linda were not able to come to the Cape this summer, but they had such a great dinner with scalloped oysters and halibut, and then this beautiful fruit dessert. So----- we had some fantastic celebrations of our anniversary. 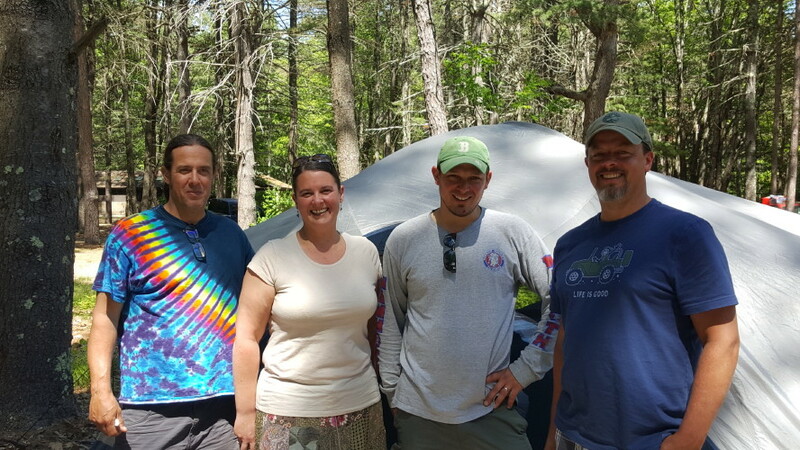 Then we headed up to Maine to touch base with Alison and Keith. They were set to take us out to a great restaurant recommended by friends. The restaurant was in Ogunquit. Great. A restaurant we knew of but had not visited. Great. Little did we know that a group was meeting in secret in Ogunquit. 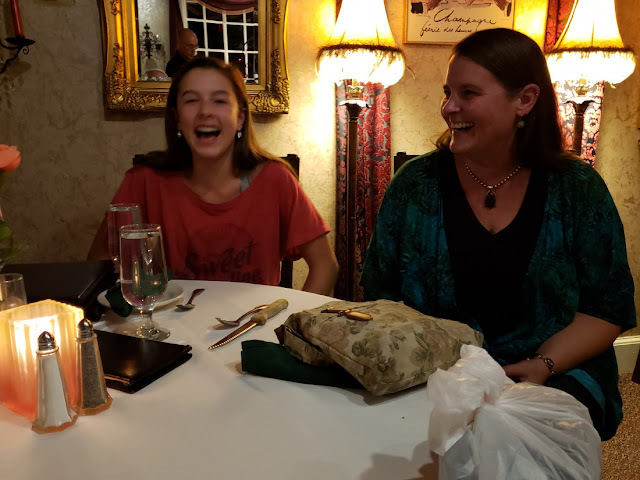 So we travel with Alison to this new restaurant and on the way we point out that this restaurant used to be a popular ice cream smorgasbord that my mother loved. Well , we walked in and were led into a room for our dinner with Alison and SURPRISE!!!!!! Wait a minute, we already had our anniversary. And their first question was "Were you surprised?" We had absolutely no clue. Well played Alison and everyone. What a nice gathering. Rachel is taking the picture. Gary, Emilie, and Linda had also planned to attend and reserved a hotel room. But an emergency came up and they had to reluctantly cancel. Also realized that friends Nancy and Dave could not be here because they were---in Scotland!! The menu was superb, including some great wine. 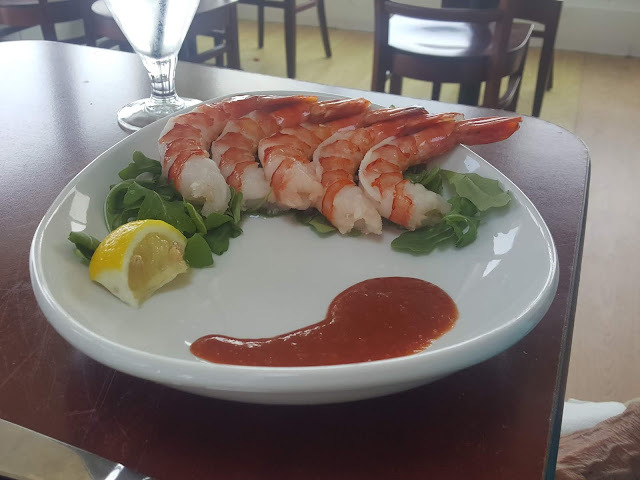 Mussels, baked brie, and some great entrees like baked haddock, scallops, and prime rib . Thanks again to Scott for the fine details and probably some of the headaches in coordinating. 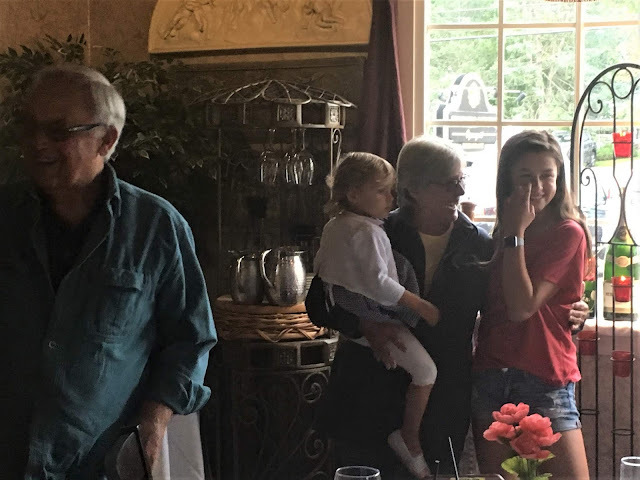 We have included two pictures of Madison and Auntie Ali. They see each other so seldom. They both are similar in loving to laugh! The travels of Ed, Carol and Gopher the dog. From Tioga, Pa. to Emilie's Graduation in R.I.